WASHINGTON — In an era of deep partisan division, the Supreme Court could soon decide whether the drawing of electoral districts can be too political. A dispute over Wisconsin’s Republican-drawn boundaries for the state legislature offers Democrats some hope of cutting into GOP electoral majorities across the United States. Election law experts say the case is the best chance yet for the high court to put limits on what lawmakers may do to gain a partisan advantage in creating political district maps. “If the court is not willing to draw a line here, it would suggest the court is unlikely ever to feel comfortable setting a limit,” said Richard Pildes, an election law expert at New York University’s law school. 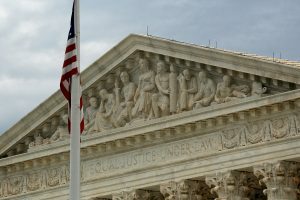 The justices should correct the lower court’s “flawed analysis before it spreads to other jurisdictions and interferes with the states’ fundamental political responsibilities,” Texas Solicitor General Scott Keller wrote for 12 Republican-dominated states that are backing Wisconsin. The issue has torn the court for decades. Some justices believe courts have no role to play in a matter best left to elected officials. Others say courts should step in. In 2004, Justice Anthony Kennedy staked out a position somewhere between those two views, saying courts could referee claims of excessively partisan redistricting, but only if they can find a workable way to do so. In that case and again in 2006, Kennedy didn’t find one. “The court is surely aware that this decade produced some of the most aggressive partisan gerrymandering in the modern era,” Pildes said. The Wisconsin case seems promising because the lower court said it found a way to measure the partisan nature of the districts. The court adopted an equation offered by the challengers that essentially measures and compares each party’s wasted votes —those going to the winner in excess of what’s needed for victory — in an election. Republicans might stuff Democratic voters into Democratic districts, leaving other districts with Republican majorities that are essentially just large enough to elect GOP candidates. This “efficiency gap” identifies districting plans that are likely to accentuate one party’s control over the 10-year life of the plans, said Eric McGhee, a research fellow at the Public Policy Institute of California who helped develop the measurement.